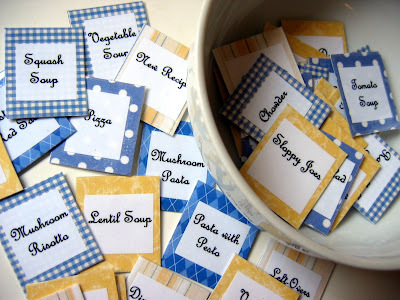 If you are someone that is way more organized than myself, you will love this tutorial from The Red Chair Blog that shows you how to upcycle those obnoxious advertisement magnets into fancy meal planning magnets for you and your family. We love the idea of these, but we just aren't those kind of people who plan ahead. Perhaps we could put events on these instead of food? Things we know are coming up in that week so that we can let the other person know what's on our schedule?? Head to their blog to find the printable PDF for these!! 1. Start by flipping through your recipe file and listing your favorite "old standby" recipes. This tutorial will teach you how to make 35 magnets, but you can make as few as you'd like; you can always add more later. 2. Open Microsoft Word and create a table that is 5 squares wide by 7 squares high (my "squares" were each 1.25" x 1.5"). Type the name of one meal in each of the squares. Keep it simple--just name the main dish. You might also want to make several magnets that say "Left-Overs", "Dinner Out", "Take Out" and/or "New Recipe". I used a 22 point French Script MT font, and I centered the meal names in the squares. 3. 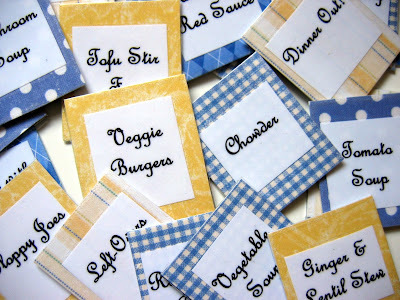 Print your page, and cut out the meal names. My meal names were smaller than the outlined squares once I cut them out. This doesn't have to be perfect! And yes, if you look carefully, you'll notice that one of my meals is scrambled eggs. What can I say? I'm a lazy cook! 4. Using scissors, cut a magnet to roughly 1.5"(w) by 1.75"(h). Cut a piece of scrapbook paper to the same dimensions. If you really want to annoy your friends & family with your fastidiousness, you can color code your magnets. I used yellow for meals that are protein-based, and blue for "carby" meals such as pasta dinners; that way, I can tell at a glance if my week is balanced (I'm a vegetarian, so I need to be mindful about protein). 5. 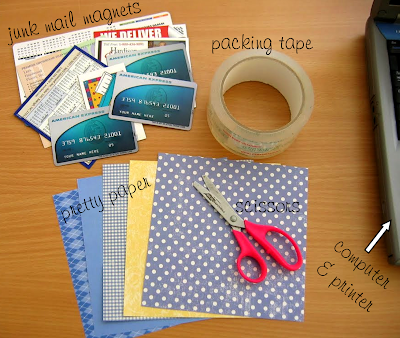 Using double-sided tape (or very good fine motor skills) to keep the layers in place, layer the magnet, scrapbook paper, and meal name. 6. "Laminate" the whole thing with packing tape. To do this, cut the tape a little bit longer than the magnet, cut off all four corners of the tape, and fold toward the back (see below). This step can be time-consuming, but it's mindless enough that it's a good while-you're-watching-a-movie project. 7. 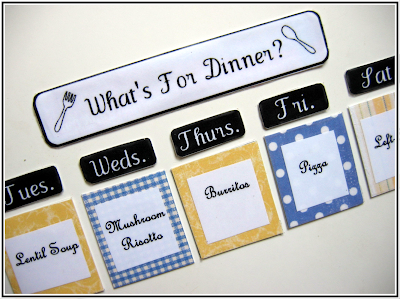 If you'd like to use my days of the week and the "What's For Dinner" header, you can download a free PDF from my website here. I'm 99% sure that this PDF is working and is scaled properly, but please let me know if you discover a problem! 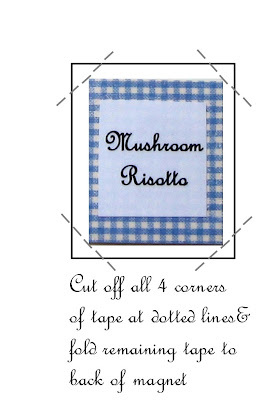 To "laminate" shapes with rounded edges using packing tape, use "V" shaped notches to navigate the curves. 8. Arrange the current week's magnets on the front of your fridge--keep other meal magnets on the side of the fridge for planning future weeks' meals. 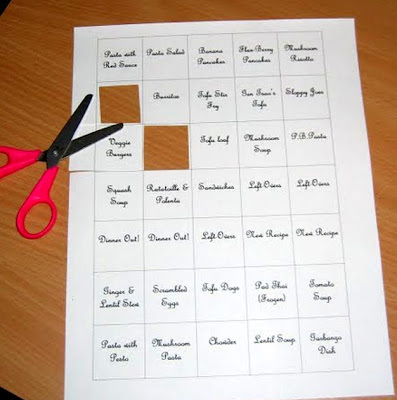 To further streamline your meal planning, you can make your own customized, pre-printed grocery list with the instructions that I provided here.